Democratic incumbent Sen. Michael Bennet (Colo.) said the Iran deal is "going well," and that it is "obvious" that billions in sanctions relief to the Islamic Republic could go to support terrorist activities. Bennet, a supporter of the deal, gave an interview with the Denver Post to discuss the nuclear agreement a year later, and how it is affecting his reelection campaign. "I think the deal is going well, so far," Bennet said. "Obviously, we have to be vigilant. … Some people say, ‘Well, how can you trust Iran and do a deal with Iran?’ The whole point is that I don’t trust Iran. I don’t trust Iran. That’s the point." Since the deal was signed last year, Iran has launched ballistic missiles in violation of a United Nations resolution, expanded its terror network in Latin America, violated international law by detaining U.S. sailors, and prepared to reopen nuclear sites that were shut down as part of the deal. Bennet said Iran has adhered to the terms of the deal "in general." "I think they have violated United Nations sanctions with respect to ballistic missile activity, and that’s why as part of my consideration of the deal, I introduced a bill—that has not passed yet—with Sens. (Ben) Cardin and (Chuck) Schumer, who both opposed the Iran deal, to track Iran’s use of funds and track their support for proxy terrorist activities and state in clear legislative language that all options including military force remain on the table," he said. The Denver Post also asked Bennet about the roughly $100 billion in sanctions relief Iran received from the deal, and the Democrat said it is "obvious" Iran could use sanctions relief to fund terrorism. Post: Secretary of State John Kerry has acknowledged some sanctions relief may go to terrorist groups. Did you know this before you announced your support? And would this have changed your mind? Bennet: I think it’s obvious that if Iran receives the proceeds of the sanctions relief — whether or not we did the deal, because they would have had the benefits of those proceeds — they could have used any number of activities. But you should also know all the international reports that I have seen on this suggest that the amount of money (from sanctions relief) is far less than what anybody thought it was when the deal was struck. The estimates were that it was $150 billion. I think it’s closer to $50 billion. But that’s the reason why I wrote the bill with Cardin — to make sure we were tracking the proceeds and we had a regular reporting mechanism to Congress about what Iran was doing with the proceeds and if in fact they were supporting terrorism. Iran also received a $1.7 billion settlement from the United States, including a $400 million cash payment. The Obama administration withheld details from Congress regarding the cash delivered on wooden pallets from an unmarked cargo plane, which many lawmakers are calling "ransom" in exchange for the release of U.S. held hostages. The administration also is allowing Iran to build two new nuclear plants, which it says will not violate the terms of the deal. Bennet’s opponent, Republican Darryl Glenn opposes the nuclear deal, arguing the agreement makes America "less safe." 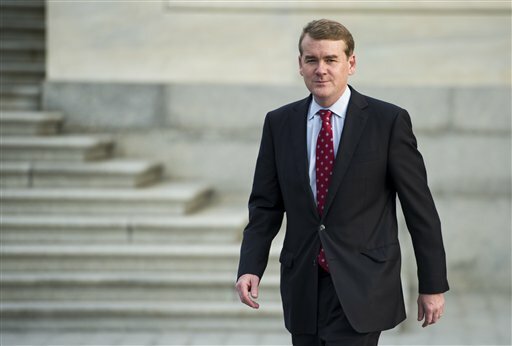 Clear Creek Strategies, a Colorado-based consulting firm, blasted Bennet’s interview, saying his vote for the deal endangered national security. "It's about time Senator Bennet admitted his vote for the Iran deal was also a vote to give the world's largest state sponsor of terrorism billions of dollars to fund their terrorist activities," said Matt Connelly, a Republican strategist for the group. "What's truly amazing about his statement is that he also indicates he knew the money would go to fund terrorism from the very beginning." "Whether it's his vote for the Iran deal or his support for closing Guantanamo Bay, Senator Bennet has been dangerous for our national security and his policies are jeopardizing the safety of Coloradans," Connelly said. This entry was posted in Politics and tagged 2016 Election, Iran, Michael Bennet. Bookmark the permalink.